- In order to trigger Pull the Plug you must first find Thicket Excavations. It’s a large dig site to the east of the Red Rocket Truck Stop. You’re most likely to find it on your way out to either the USAF Satellite Station Olivia or Tenpines Bluff. - Talk to Sully. He’ll ask for some help draining the lake in the middle of the pit. 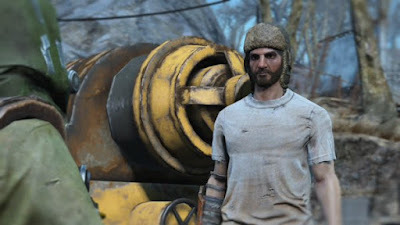 Agree to help him (you can convince him to give you some extra caps if you’re persuasive enough) and he’ll ask you to look for ‘bubbles’ on the surface of the lake. If you look down at the side of the pipe coming out of Sully’s big, yellow pumping rig you’ll see the bubbles he means. There are two more sources of bubbles in the lake as well, one close to the top-right corner of the lake, the other closer to the top-left corner. - Use some Rad-X to almost negate Rad buildup, then jump in the water and sink down to the bottom of each of the bubble locations. Follow the pipes in each location and you’ll find yellow valves maybe fifteen or twenty feet below the water, set into the pipes. (The top-right pipe isn’t visible until you’re underwater, mind, but it is there.) Repair all three valves. Note that these breaks in the pipes are not at the bottom of the lake! They’re nowhere near the bottom! Don’t try to go all the way down, or you’ll likely just drown. - Talk to Sully and he’ll tell you to turn on the pump. Do so, however, and you’ll make two Softshell Mirelurks appear. These well-protected crab creatures hit relatively hard, but you can take them down with shotgun blasts to the face or torso. (Don’t hit the shell. You’ll do next to no damage.) Once they’re dead, talk to Sully for your reward. 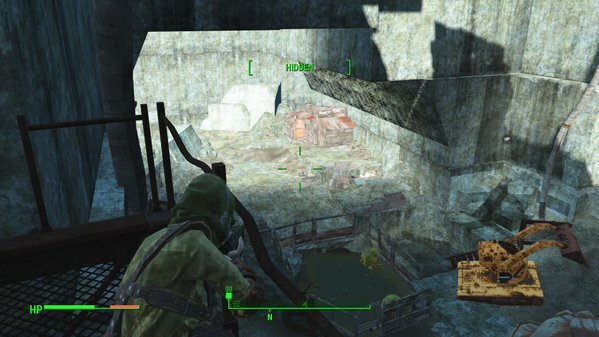 The shack at the bottom of Thicket Excavations in Fallout 4. - That’s the end of the quest, but… it’s not really the end of this area. Go away somewhere, have a nap, and come back. (A day of in-game time seems to be enough.) You’ll find a bunch Raiders at the top of the pit, and more on the lower paths once you start a gun fight. (And unless you’re really quiet, there will be a gun fight.) Pick them all off, using the blocks here for cover - the only melee fighters you really need to worry about are a Raider with a pipe and a Mongrel - then head into the newly-drained pit. - Surprise! There are plenty more fighters down here, and most of them have guns. A good, long-ranged rifle is the order of the day if you want to get into a fight, as there’s a lot of open space for enemies to snipe you or blow you up. A sniper rifle can make short order of this area if you have one, though it’ll take a while, as enemies will keep running around and hopping into blind angles. - Make your way down as you kill. There are now sheds and trailers to duck into along the way, with plenty of items to collect… though, honestly, nothing very notable. Grab whatever you fancy. And, yes, you have to get to the very bottom of this place, where there are some rather obvious Softshell Mirelurks in attendance. You can snipe them from above, if you want, but they aren’t a problem for you anyway. - Have a look around once Sully and the Raider are dead. Sully himself has some nice stuff on him - mainly ammo, but he has a decent Sighted Hair Trigger Combat Rifle to steal, and dayum, you can steal his hat! - and the trunk in the shed he was protecting contains some Bottlecaps, as well as some Pocketed Metal Arms. - One final note. It's likely that Thicket Excavations will not be marked as 'Cleared' on your map after this quest. Leave and come back a few days later and you'll find more Raiders have taken Sully's place. Kill their boss - he's in the same shack at the bottom of the pit - to clear the place. I got a modified pipe rifle from Mathis' body (playing on very hard, level 13-14), loot is probably randomized. I've got everything checked off but it's not going into my completed quests.